Toddlers are a beautiful blend of curiosity, enthusiasm, love and light. They need a flexible balance of love and support, and opportunities for space and independence. Our Toddler Classroom offers children a first step in extending their world of trusted people into another safe and nurturing environment outside the home. Toddlers awaken to the joy of navigating new relationships and indulge their natural curiosity through new activities and the use of new materials. A central focus of our classroom is encouraging self-care through the development of practical life skills. Children gain confidence as they master new tasks and enjoy more independence. The classroom is set up to encourage growth in everyday skills, such as removing one’s shoes and outerwear, putting on slippers, setting the table and clearing dishes, and using the toilet. Other examples of practical everyday work skills include scooping, pouring, zippering, snapping, buttoning and sweeping. Language is an area of huge growth for children in the first three years of life. Among toddlers, there is a wide range of language abilities. In our classroom, children develop language skills through peer interaction, teacher modeling, books, and specific work that facilitates vocabulary growth and conversational interaction. Our senses help us to navigate the world around us. Young children especially benefit from being introduced to sensorial materials and experiences. Classroom sensorial materials include musical instruments, color paddles, textured blocks (for rough and smooth), beading, and sorting objects by shape or color. 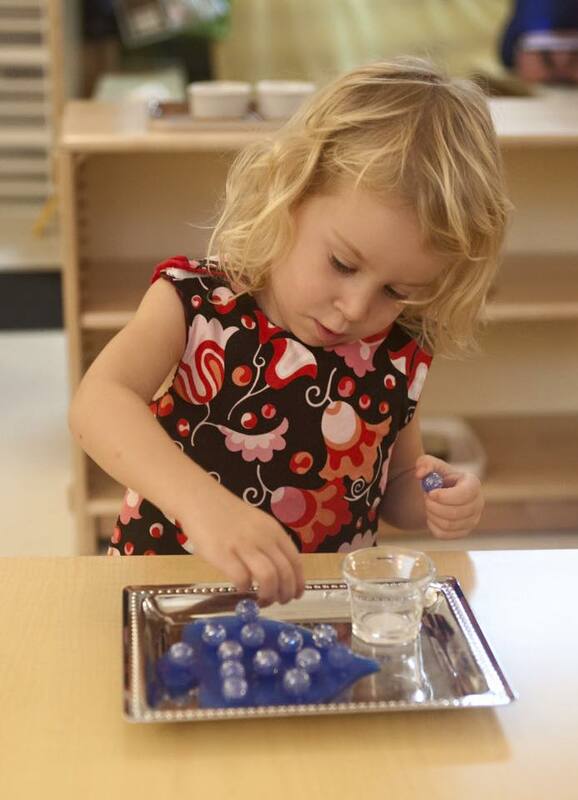 Toddlers are exposed to numbers through counting games and songs and physical materials. Toddler Math activities include counting books, stacking and nesting cubes, number puzzles, and sorting. If Toddlers are awake, they are moving! Whether they are using their gross motor skills to crawl, walk, run, climb, jump, dance, or roll; or, their fine motors skills to paint a picture, zipper a coat, or pick up a small piece of food… Toddlers need to move! In our classroom, Toddlers enjoy a variety or both fine and gross motor activities to meet their needs and release their energy. Fine motor exercises include using tongs to transfer small objects, drawing, beading, flower arranging, pouring and scooping. Gross motor equipment and exercises include: free standing stairs, rocking boat, tunnel, slide, stepping stones, yoga, music and movement, and outdoor play. In our classroom toddlers enjoy the use of water colors, acrylic, finger paints, colored pencils, markers, play dough, glue, tissue paper and other art materials to explore with and create their own artwork. We invite you to call the school (978-462-7165) to request an application and schedule a tour.